I am a part time Explainer and part time Learning Content Developer here at the National Railway Museum. As an Explainer I am out on the museum floor working with a wide variety of audiences delivering a wide variety of presentations and workshops. 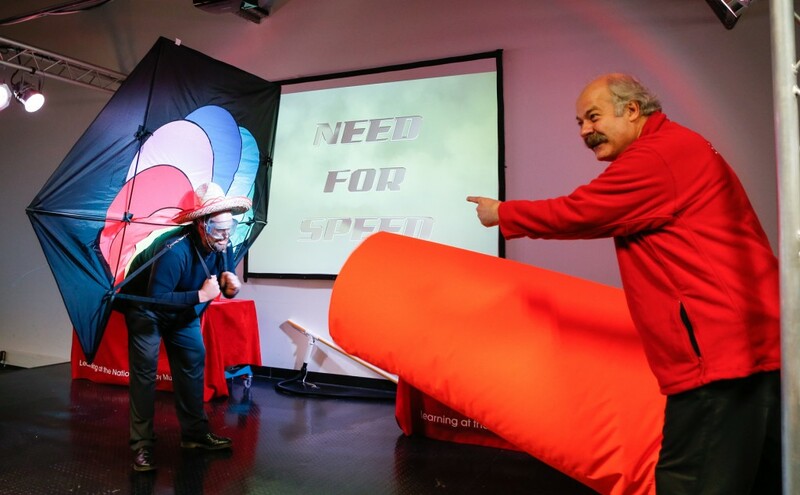 I am also involved in developing the school and family offer which the Explainers then deliver, the latest one being a brand new science show called ‘Need for Speed’. The show will be launched at the beginning of our upcoming Flying Scotsman season in late February 2016 and we’re well under way to make it an incredible show. What’s it all about? Well, it is an interactive show all about speed and how we have always been obsessed with making things go faster. To explain this we take a look at lots of different locomotives (including Flying Scotsman) to see how we have been able to achieve such amazing speeds using trains. Like our other – incredibly popular – science show From Rocket To Bullet this show is being catered for families of all ages but will also be offered to school groups aged between 7 – 11. In recent weeks I have been working hard with some help from fellow colleague and Explainer Developer Shaun Houldridge to come up with exciting demonstrations that will be an integral part of the show. This is a slightly unusual process as many of the demonstrations need to be built and tested first before we can be sure that they will work! Recently we have successfully tested our vacuum powered Hyperloop demonstration – a new and revolutionary form of transport which is still at the experimental stage. The fun side of doing this kind of thing is that Shaun and I have been firing lots of rockets using vacuum power across our stage area into a crash mat, an activity that never gets old! We have also been experimenting with another demonstration which will use an audience member to show how streamlining can help to increase speed. Like many experiments though they don’t always work as the first picture below shows Shaun appearing to attack one of our Explainers (Phil) with a leaf blower. This was our first test for this demonstration but you’ll be pleased to know that we have since invested in a huge industrial fan and attached a giant custom made wind sock to it. The volunteer has to wear an enormous kite strapped to their back as well. 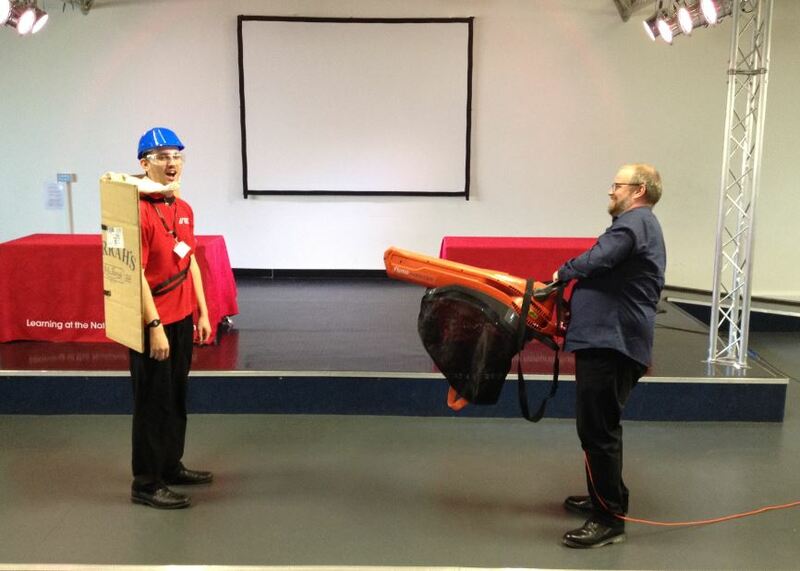 In the picture below Shaun models the finished kite harness this time with the help of fellow explainer Ian. All in all things are moving forward well for the show. I have also been working with an animator who is providing us with some high-tech custom made animation to accompany the show and I have also just finished the script. Early in the New Year I aim to have the show complete and ready to begin training of our Explainer team in mid January. So I hope you will come along from March and take part in our brand new show and help us find out why we all have such a ‘Need for Speed’. 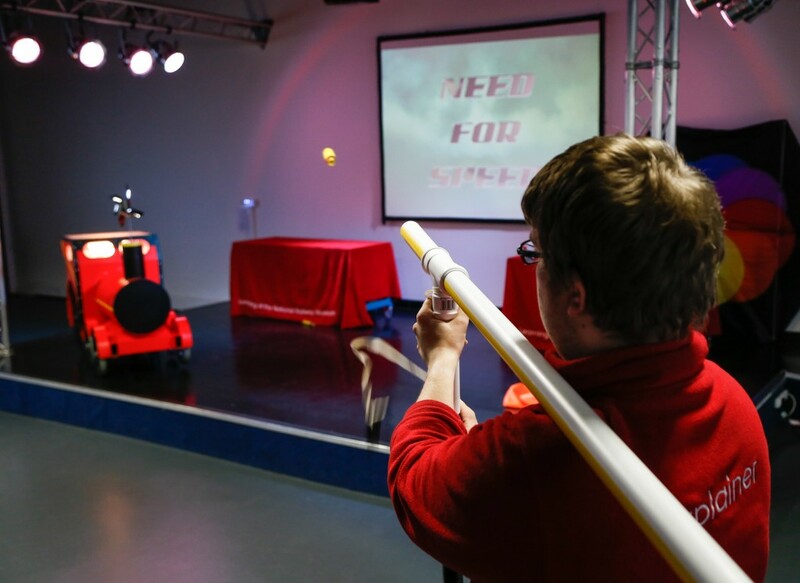 ‘Need for Speed’ is being developed as part of our Scotsman Season. This entry was posted in Events and Exhibitions, Learning and education and tagged Education. Bookmark the permalink.